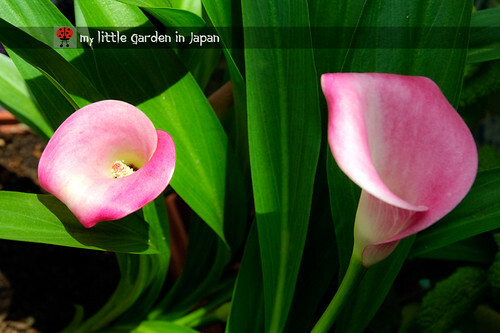 my little garden in japan: The calla lily is sprouting early! This week I had a better chance to sort out all my seeds and set up everything for the spring. I did the planning for how the planters will be and also a buying list. But when I was sorting the bulbs I noticed that the calla lily bulbs started sprouting already. It happened as one of the consequences of me being sick. Winter here is cold, but I don't mind as much, so I hardly ever turn on the heating. That means inside has good temperature for storing the bulbs. I had let them next to the window last month after collecting them. However, when I was sick, I turned the heating almost every night and I forgot to take the bulbs outside. So, they felt that sudden raise in temperature and decided to sprout. The biggest have a big enough start already, but hopefully they will be ok.
Now I have to decide what will I do. If I will keep them indoors until they gain strength and the weather is not as cold, or should I take them back out and let them fall asleep again. Any suggestions? My plan for the calla lily is to grow it in the same planter as the tulips, so while ones grow in winter and spring, the others will do it in summer and autumn. Have anyone tried this before? I am not sure if they will be compatible. 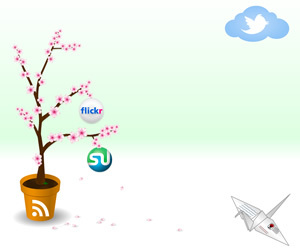 Also, hope you noticed my internet tree got some snow on it. We finally had a couple snowy days last week but I forgot to mention on the blog until now. The plants did well, only the little peppers seem to have minded the cold. I wrote a little about it on my twitter. Follow me there for some tips and more about gardening. Also, there I write more about the things as they happen so it works a bit like a real time live news feed. Sorry Fer, I have no experience with calla lilies so I can't really help on this. I reckon though that once a bulb has started sprouting, it is probably best to let it develop because if you try to check its growth it will get confused and will not perform well. Maybe keep the Calla outdoors, but protected in one of your cold-frame things? Well, I really don't know either but I can tell you this, here our daffodils start growing really early in the winter (I think mine were up in December this year) and they grow some and it gets cold and they stop, then it gets warm and they grow some more. Perhaps they are just used to it (and we don't usually get below about 20 F) but it doesn't seem to hurt them. I would imagine if you put these out now they will just stall until it is warm again. Gardening in 4-season country is so challenging! We don't have such thing as go back to sleep or when is the time to wake. Anyway good luck to your calla lily, i'm sure she will be fine in your hand! I would leave them indoors until it's safe to put them outside with the weather. fer, I don't have experience with bulbs indoors but I can tell you in a cold climate our spring weather jumps up and down the thermometer constantly. I've had daffodils pop up in the garden and then had a freeze and snow. The bulbs just go dormant when the weather chills and then start growing again when the temperature rises. In the UK calla lilies are sold as house plants as well as garden plants so they will be OK inside. The only problem is that they may flower too early for you to plant them out. If you do take them out I would bring them back in on a night or if the temperatures fall too low or the change in temperature will shock them. Or as Mark says give them protection. I guess I will leave them indoors. Hopefully it will only be a month before the weather gets better. I wrote a comment, but must have accidentally pushed the wrong spot when I was going to leave my word verification, and an ad popped up. When I hit the back button, my comment was gone. Dear Fer, I am sorry to read that you have been ill and do so hope that you are now on the road to recovery. I do not really know how to advise you about your bulbs except to say that generally bulbs are rather forgiving and will compensate for one's errors. I am sure that they will adjust, just as when planted upside down they tend to re-orientate themselves!! Hi fer, I hope you are feeling better! The calla lily is ready for spring I think. Perhaps you could keep it in a pot until it's warm enough? I would probably leave the calla inside until it warms up. Frosty temps can turn the new sprouts to mush pretty quick. As for planting with the tulips, I have never tried it. But I would be worried that the watering needs of the calla might cause the tulip bulbs to rot once the weather warms up and they go dormant. My callas are sprouting as well. I 've been growing them in the garden for several years and I never move them from there. Currently we have about 10°C during the day, but in winter the temperature often reach -5°C in the night. They never had problems. Fer I would also advise you to leave them in the cooler temperatures. They should be fine, and will start growing again when it warms up. Hope you are feeling better now. I hope you are on the mend. It seems like caring for plants can be healing to the psyche as well. Hi Fer, Sorry to hear that you have been ill. I am glad that you are now feeling better. I have no experience with Calla Lilies however, I find that bulbs generally self-adjust to adapt to changes. Bring them in and they sprout. Put them back in the cold and they go dormant again, waiting for warmer temperatures to return. I will be interested to see how the calla lily, tulip combination works! I think if you planted them outside now, they would be fine. They will slow when it's cold, then start growing again when the temperature warms. Good luck! Are you feeling much better now? Hope your calla lily will continue to grow. Perhaps putting them indoors for another month will trick them to do just that! I love calla lilies and always admire them, but I never thought to buy one and have a plant of my own. I should definitely do that. I agree with others that you should keep in indoors, but if possible in a cooler part of a house, so you postpone the growth as much as possible. I would try to harden them off a bit, put them outside during the day when the temperature rises, then bring them back indoors at night until the weather outdoors improves a little. We've got snow again here today. I have never grown one but admire them very much ... just so beautiful ! I am sorry to hear you are not well. I hope you get better soon. I was out shopping yesterday and saw some calli lilly bulbs and now I regret not getting any! Just beautiful! Thank you a lot! I am feeling fine now. It was just a bug last week. Hi, good to hear from you. I think the Calla Lilly and tulip combination sounds good. Whether they will be compatible will depend on whether you want them to be a perminate combination. Tulips want no water during summer (its why in the UK they are lifted- too much rain). If the Calla lillies need irrigation then the Tulips will probably rot during the summer. In the UK I usually treat Tulips as annuals anyway - here in Italy with the dry summers they reflowers in succesive years. 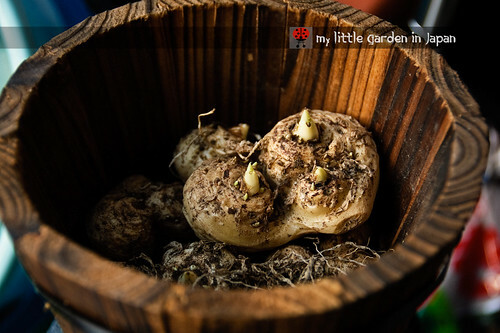 Plant them in the same pot at the proper depth for each, some would call it a bulb lasagna. Planting them will give some insulation for the calla also. Oh, I hope you get to feeling better soon. I don't have any advice for you about your Calli Lilly...but yours looks beautiful and healthy. Todays Boz Scene is a type of wild cherry that grows along the New England coast. It's not in bloom yet as we are still covered in snow. take care now and happy gardening! Depending on the species, calla lilies are fairly cold-hardy. I had some that survived last winter outdoors here in Virginia, USA. We will see in a few months if they made it through this year. I think whatever you decide to do with them, they'll be fine. But I'm not so sure about combining them in a container with tulips. The callas like a moist soil, but the tulips want a dry soil during their dormant period. In a container with very good drainage, though, it might work. I have two big pots with different bulbs in my terrace: only crocus and on dafodil bloomed. Your last year cala looks espectacular! Good luck with your calla lilies! This Calla lily is very beautiful. I hope it will bloom for you nicely. I have the old fashioned white calla lillies blooming in a cluster outside my windows. They've grown in the same place for 80 years. At night they look like a fleet of sailing ships. Fer, I do hope you are feeling better by now. Your calla from last year look so lovely! I have never grown these so cannot advise but not sure a bulb will go to sleep again after being awaken. Good Luck! How gorgeous!! That is the most beautiful colored calla lily...such a lovely shade of pink!! It will be interesting to see how your Tulip/Canna planting works. I think if it is snowing it would be best to keep them indoors - but in the coolest place you have to slow them down. Hope you are feeling much better now! Calla lilies have pretty blooms! Hope your will survive the winter and produce many bloom! Hi Fer, hope you are feeling better, I grow Arum Lilies in pots, similar to the Cala, pure white and a little more hardy. You will have to give protection if hard frost is forecast, but I would pot them up and place under shelter when necessary.Personally, I would not grow Cala along with anything else. I think is worth a try to combine summer and winter bulbs in one planter. I will make sure to let you guys know how it goes. I fit works I will have great blooms all year.